Hi Lovelies, hope your day is going smoothly? I have been in and out of the hospital but the good thing is that I am better now. So I am back to do what I love to do most - discussing fashion and style. So spotting Lupita Nyong’o rock one of his pieces to 2016 ELLE Women in Hollywood Awards, I decided to share my thoughts regarding " Lupita in Duro Olowu. 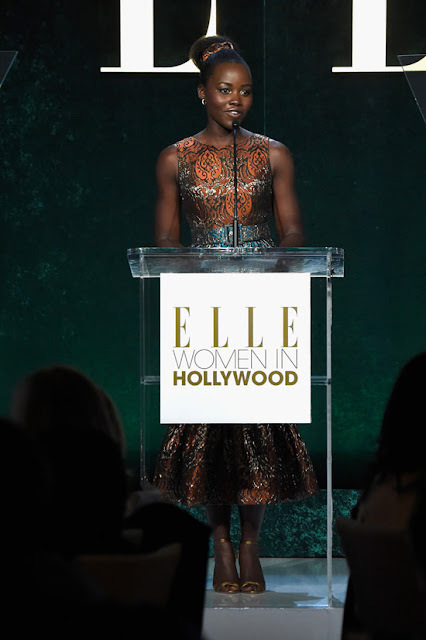 But then for a start, I like Lupita,for her enormous achievements, fashion taste and so on. However, if I were to style Lupita, I would’ve gone for a lighter brighter colour going by the colour of her skin – but you know what? She pulled Duro Olowu Jacquard Trumpet dress so very well, a parsley-like print Jacquard fabric in combination of burnt orange, metallic and turquoise colour. Again the matching belt also accentuated Lupita’s feminine figure flattering it a bit more. In my opinion,this pieces – the colour and silhouette sat so very elegant on her,being that it’s not so very easy for colour personality like hers to rock the dress in the manner she’s did. No one would have rocked it better. One take for me from this whole thing is that “fashion is experimental”. So dare to dare……. My DIY: The Chevron Jumpsuit.